All BARC members and anyone interested in Ham radio. Public welcome! The best time is 3-5pm Saturday or 10-noon Sunday. The event will run for 24hrs. During this time you will have the opportunity to get on the air and make contacts with other Field Day stations throughout the country and Canada. All visitors must sign in. 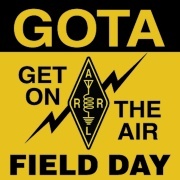 ARRL Field Day is the single most popular on-the-air event held annually in the US and Canada. On the fourth weekend of June each year more than 35,000 radio amateurs gather with their clubs, groups or simply with friends to operate from remote locations. Field Day offers many things to many people, it is a contest, club cookout, emergency drill, social gathering and more. What ever aspect of Field Day you find the most appealing to you, you will definitely have a good time. The "official" goal of Field Day is to contact as many stations as you can in the twenty four hour operating window. This is also BARC's largest yearly event and we like to have a good time. Saturday evening we all enjoy sitting down to a large pot luck dinner. Not a problem! BARC operates field day to have a good time. If you have never operated during a contest or another Field Day come on down and we will guide you through all aspects and have you operating in no time. In fact we have a dedicated station for anyone new to Field Day or Amateur Radio. It is the Get On The Air station (GOTA) At this station you will have a dedicated coach to walk you through everything. During the event every contact we make is logged into a computerized logging system. BARC has found N3FJP's "Field Day Network Logger" to be an excellent logging system. It's easy and intuitive to use. But it also offers all the functionality you would expect from a contest logger. Operating the radio, making contact and logging all at the same time is definitely an acquired skill! Whenever possible we will pair up and have one person log and another to operate and make the contacts. So, even if you don't want to get on the air, you can still log and get a good experience of what the event is like. "To work as many stations as possible on any and all amateur bands (excluding the 60, 30, 17, and 12-meter bands) and to learn to operate in abnormal situations in less than optimal conditions. Field Day is open to all amateurs in the areas covered by the ARRL/RAC Field Organizations and countries within IARU Region 2. DX stations residing in other regions may be contacted for credit, but are not eligible to submit entries." We get together as a club and have fun, collectively solve any problems that may arise, operate equipment that we might not otherwise have access to, watch and listen to other hams and the way they do things to learn in an environment that is not a formal class room, and do everything considering good engineering practice and in a safe manner. 10:00am - The goal for Friday is to get everything setup except the radios and laptops. This Includes getting the area ready for Saturday. If it is raining bring a rain jacket! 9:00am - The goal for Saturday is to set up all operating stations with radio and computer equipment. 2:00pm - Field Day contacts start!